Rivertown Toyota in Columbus, GA! Don't have 20 minutes? Then, click below for your instant trade offer! Right now, Rivertown Toyota is in dire need of quality pre-owned vehicles just like yours and we're willing to make you an offer that will be impossible for you to refuse! There has never been a better time to get the most out of your current vehicle. Drive off in a brand new Toyota with the same or even a lower monthly payment than what you're making now! The only thing we ask of you is to hurry! Market conditions change fast. The longer you wait the less you may get for your vehicle! Get To Rivertown Toyota & Get A 20-Minute Proposal Today! Hurry! Time is running out to get more money for your current vehicle! 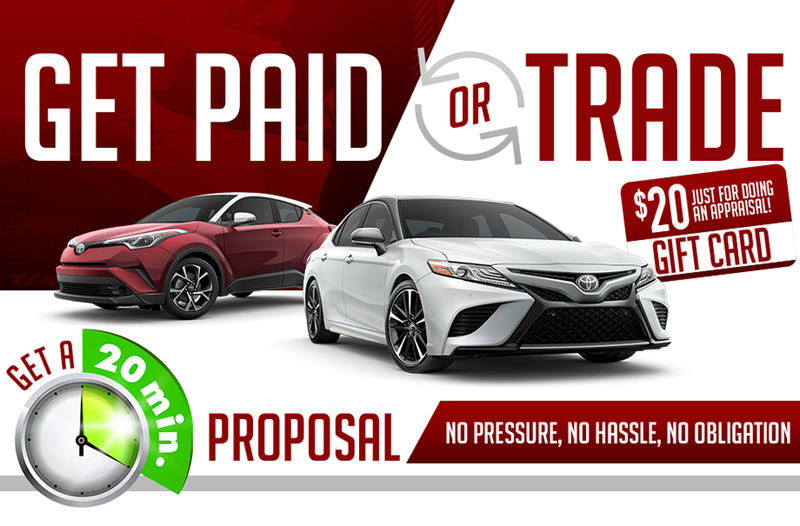 Click the button now to schedule a time for your proposal, then get to Toyota of Rock Hill today! *$20 Gift Card with vehicle appraisal at Rivertown Toyota. Limit one gift card, per person, per household. While supplies last. ^Trade in allowance is based on "fair" trade value. Deductions from allowance may be made for equipment failure, body/interior damage, reconditioning costs and/or excessive mileage. See Rivertown Toyota for complete details.